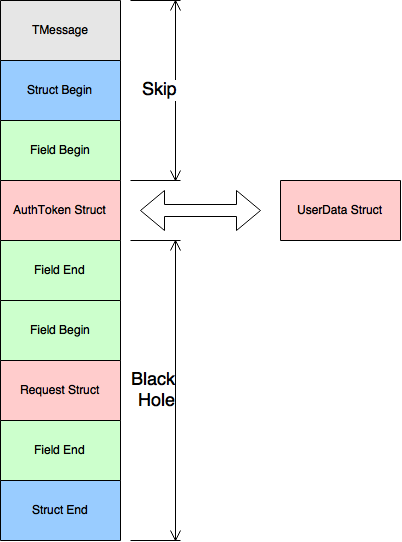 14 Sep 2015 in java microservices ~ read. In general we can't be got stuck on the protocol or transport. It is possible to select something one, of course. We could agree that we use only HTTP, but it restricts opportunities for changeover of transport and it forces to do certain external processors / filters in microservices (HTTP headers aren't native for Thrift). At this moment the mad idea comes to mind: what if to use possibilities of the protocol for substitution an external authorization token by internal while passing request through our gateway? As you see, difference beetween two services in the first argument and unauthorized exception as 99 field (I hope nobody needs more than 98 exceptions :) ). So we just need replace external token by internal and that's all. Unfortunally Thrift has very scarse documentation. 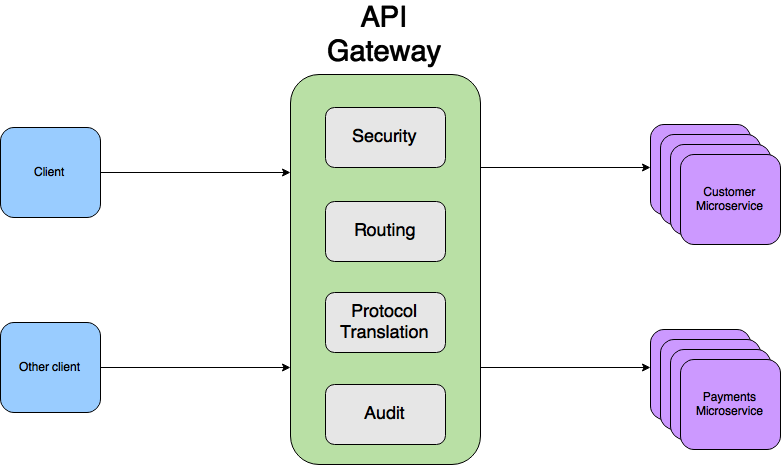 All guides including the best of them don't touch internal protocol implementation. Sad, but its clear. In 99% of cases developer doesn't need know this, but we need. Others are payload, that is packed at incoming message structure. All presented protocols read data array byte by byte and store its current index to continue reading from the right place. TMemoryBufferWithLength - we need creating new class cause TMemoryBuffer has fatal defect. It cannot return actual array length. Instead of this it returns buffer length that can be more than message length, because some bytes are reserved. Method send_getSomeData serialize message into the buffer. And finally we create our main class that would translate external message into internal: MessageTransalator. Run tests, but they doesn't work. And it's so good! We use TMemoryInputTransport transport that gives possibility to read direct from input buffer. This context stores different separators in stack while processing JSON-structure. And when it reads structure, it reads symbol ":", but it doesn't return separator back, cause our user data object doesn't have any context. Then run tests and see only green colors. New method processError is needed to us. Thrift has two classes of exceptions that we can serialize into outcoming message. First is TApplicationException that is declared implicitly. Second is custom exceptions that is declared in throws part of service definition. So, if unexcpected exception is risen while authorizating, we should create message with TApplicationException. If user is not authorized and we know about it, we should create message with UnauthorizedException. Lets do it. Some comments. According thrift protocol if TApplication is risen we should use TMessageType.EXCEPTION type of message. If custom exception is risen - TMessageType.REPLY. Also we need introducing state inside our translator to store methodName and seqid that we should fill while parse TMessage. Full listing of MessageTranslator is here. In next part we will build gateway on Spring stack.